Do you want to make your time enjoyable? Do you want to keep yourself fit in a simple and funny way? Are you interested to learn something interesting? Then the Sector 9 Aperture Sidewinder Drop Through Downhill/Cruiser Freeride Complete Longboard is here for you. This is a very high performance item and capable to satisfy all kinds of riders. It includes a solid wood deck and double King Pin trucks that gives it more stability. Due to its 34? length, you can carve and turn this board easily. It is ideal for smooth cruising through your campus,neighborhood or exploring a new spot. After you keep your feet on this Longboard, you will feel that it is created to provide you the utmost carving facility. Dimension: 34.0″ L by 9.0″ W by 26.375″ WB. Includes drop through the deck. The board is constructed with 8 ply cold-pressed maple and that makes it very durable and it can prevent any kinds of obstacles by it. The trucks of this board will allow you to attain the speed that is difficult to reach with the other common types of Longboards. Because of its 34 inches long, it is sufficiently easy to control. Includes a cut out that ensures minimal friction of wheels. Includes a long deck that allows you to cruise by providing better stability. Includes 69mm-78a slalom wheel that makes it very fast. If you enjoy curving and flexing during longboarding, the Sector 9 Aperture provides you great advantages. Besides, the gull-wing Sidewinder trucks help to turn and cruise around easily. This kind of cruiser has a slight concaving on the top and that has a blend of chamber. 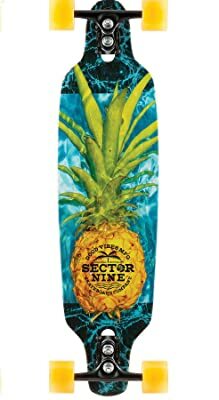 The 34″ Longboard is usually suitable for those who want to find some additional standing space or spread their feet for maximum pleasure and full control.This Sector 9 Aperture Downhill Longboard is lightweight and really great for speed-thirsty rider. High quality wheels and bearings are very important for a Longboard. The wheels of the Longboard give more comfort and minimizes the tension of your ankles. Besides, they are very smooth, so you will be able to go for an ultra-smooth race. The board also contain quality bearings and you do not have to give more effort during cruising. The flexibility of the entire board is awesome. You can move very smoothly and softly with this model. Because of its great maneuverability, the Sector 9 Aperture is ideal for freeriding as well as cruising. The board is difficult to ride at high-speed, so beginners should have to be aware when riding or upgrade their wheels. But, there is no problem for intermediate level riders to go for downhill longboarding. Its side winder truck setting is very flexible for riding. It will enable you to go fast and keep you stable during climb down. The Longboard has a compact design withbeautiful graphic. 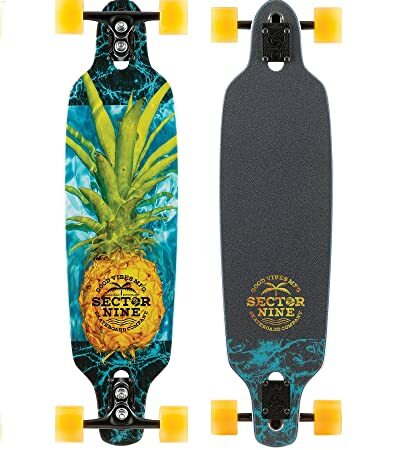 If you want to go for a very speedy ride (especially downhill longboarding) and ride for your enjoyment, then you need Sector 9 Aperture Sidewinder Drop Through Downhill/Cruiser Freeride Complete Longboard. It is also good for intermediate level longboarders due to its flexibility during cruising and freeriding. It can be said that this board is one of the greatest inventions of Sector 9 Longboard.